MEP+-it is a universal lime-cement plaster which can be applied to many (insulating) mineral surfaces, both interior and exterior, as either a base coat or a finish coat. On highly insulating surfaces such as aerated concrete we recommend the use of Strikocem MKL (- it). MEP+-it cannot be used on plaster meshes. It is an ideal base for Strikocem finish coats from the mortar groups CS-I (P-I) and CS-II (P-II), for Strikolith decorative plasters and for tiling (max. 15 kg/m2). Strikocem MEP-Plus- it can be applied manually or using a machine. If using a machine, clean the machine and the hoses immediately after spraying has been completed. When applying using a machine do not interrupt spraying by more than 10 minutes. 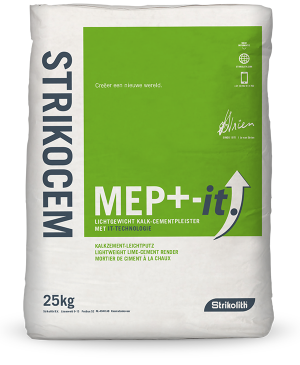 Mix Strikocem MEP-Plus- it using clean tap water (approximately 7L per 25 kg bag) to form a lump-free homogeneous paste. Mix a maximum of 3 x 25 kg bags each time. Never mix more than you can apply within 20 minutes. Do not re-mix, mix or apply material that has stiffened. To guarantee optimum curing no other materials should be added and the machines and hoses must be thoroughly cleaned. The maximum layer thickness per application run is 30 mm. Roughen the base layer horizontally when applying multiple layers. The maximum system thickness for Strikocem MEP+-it is 50 mm. In the event of applying multiple layers you must ensure that the next layer is not thicker than the previously applied base layer/covering layer and that the base layer has been allowed to dry 1 day per 2 mm of layer thickness. At high temperatures, combined with a very moisture-absorbent surface, apply two wet-on-wet layers. Due to the accelerated bonding time the roughcast layer can be processed (polished/sanded) after approximately 2 hours. For optimum sanding result the Strikocem MEP+-it can be over-plastered to gain thickness and sanded down (no later than) the next day. During application and drying protect the plaster against the effects of the weather. In dry weather and/or when there is a risk of fast drying moisten the plaster over several days using tap water. Strikocem MEP+-it is not to be applied when the air and/or surface temperatures are < +5º C / > +25º C, or when frost is expected. Before your first application using Strikocem it products contact the Strikolith Infocenter.